It’s now August 4th, but I will backdate this to July 17th once I get it posted as that is when Kelly sent out the email update below. Much thanks to her for the write-up, as well as managing/planning virtually the entire trek as I tried to keep up with some ongoing work email/projects. And apologies from me for taking so long to get ‘caught up’. We returned from Peru on July 20th and hopefully this is the last back-dated post. 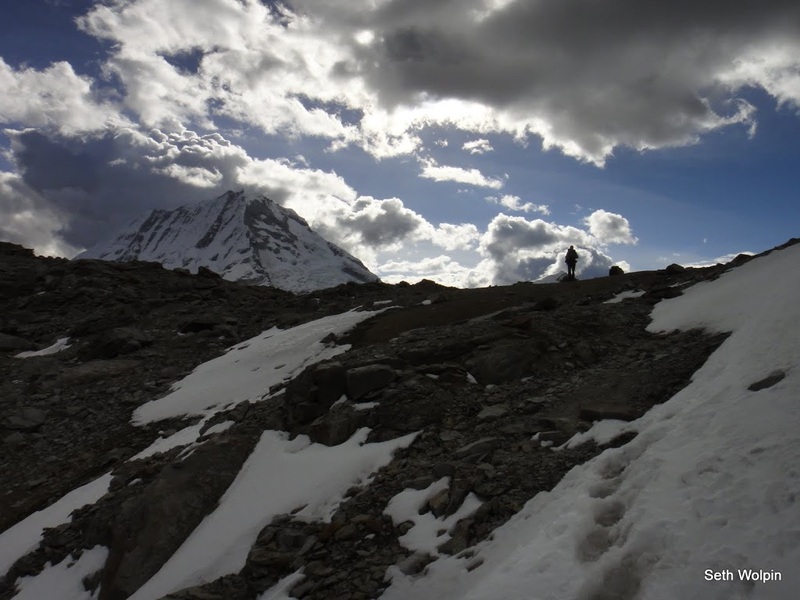 After that – another class trip to Annapurna Base Camp in Nepal, leaving on August 17th. And once the students leave on Sept 13th – I’m looking forward to running the Annapurna Circuit with friends Scotty Railton and Rich White. Home in late September hopefully to some funded grants along with some more adventures in the pacific northwest. 7/17: This Peruvian adventure is rapidly coming to a close, so I thought I´d write with one final update on the adventures we´ve been having. When last I wrote, Seth and I were getting ready to head from Cuzco to Huaraz in search of more mountains and hopefully drier weather. We found both! It felt like a lot of travel to get here – a plane ride with perhaps the most annoying and offensive seatmate either of us has ever had, followed by 8 useless hours in Lima (which we spent at a mall near the bus station – rad) and an overnight bus ride on a double-decker bus that seems like it must be designed for maximum motion-sickness, finally arriving in Huaraz in the early morning. The town of Huaraz is decidedly not-so-beautiful, but its setting is spectacular. It sits around 10,000ft up at the base of the Cordillera Blanca, which, if rumors are true, is the world´s second-highest mountain range. We spent a couple days in Huaraz getting ourselves organized for a trip into the mountains – navigating a strangely complicated and nebulous permitting system, shopping for food and gas, and figuring out how to get to our starting point and how to get back out when we were done. Some friends of friends own a guiding company here and they generously met up with us for dinner and gave us a great idea for a 4-day trek and helped us figure out some of the logistics. 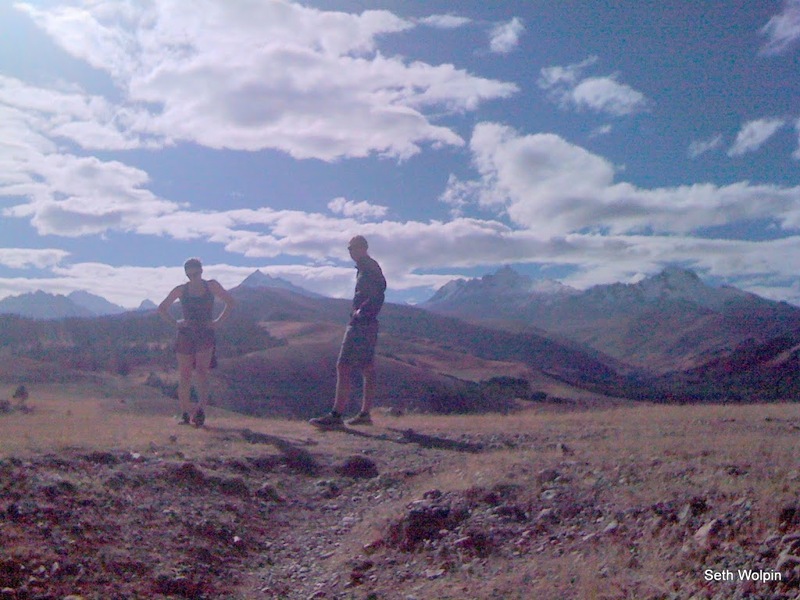 And the next morning, one of our new friends took us on a breathtaking (literally an figuratively) trail run above Huaraz. On Tuesday morning, we were off! 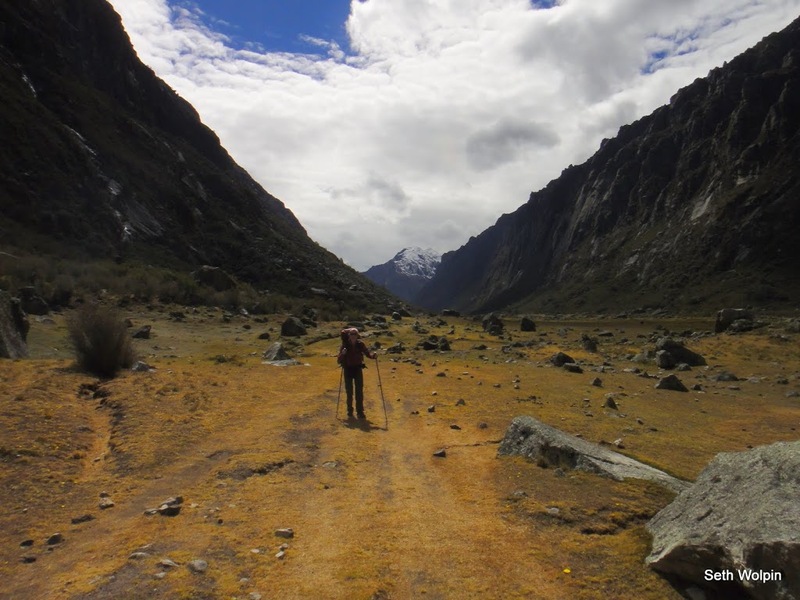 We hiked up the stunning Quilcayhuanca valley – a dramatic, glacial-carved valley with a totally flat, green floor surrounded by beautiful peaks that just get bigger and bigger the farther in you go. We took the first day very easy since I had developed a headcold overnight and was pretty pooped out all day. We set up camp in the middle of what turned out to be endless cow/bull/horse pasture, artfully stabbing and tossing cow patties into neighboring patches of grass as we cleared a tent-sized, poop-free space. 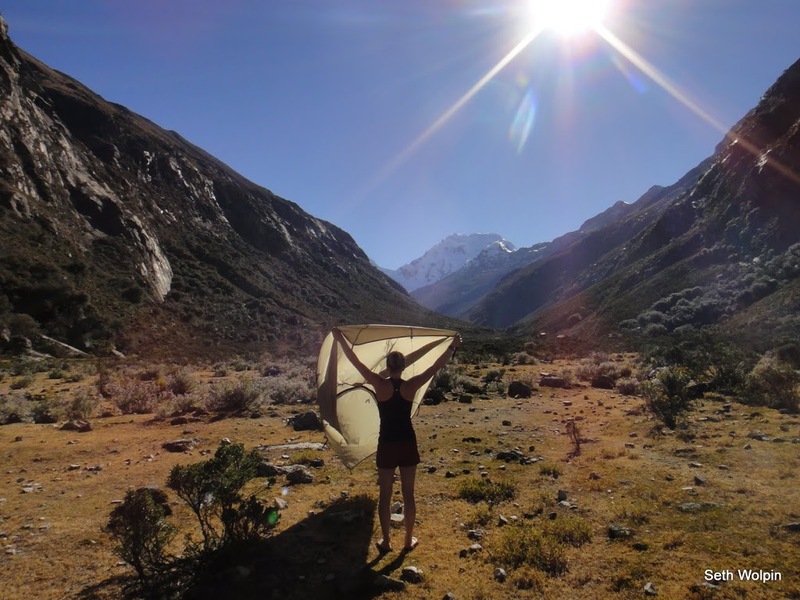 Kelly at the Pass – 16,700 feet! Day 2 of the trek was the big day, when we were slated to hike up and over a nearly 17,000ft pass and into the neighboring valley. In hindsight, we got far too late of a start, especially considering that we hadn´t advanced as far up the valley as originally planned because of my cold, and we knew the crossing was going to involve some route finding. The hike was spectacular – but definitely strenuous as, even after 3 weeks at altitude, it is still proving to be a very slow and panting-inducing process to hike up steep hills with a full pack at 14,000ft and above. By the time we finally got to the pass, I was starting to feel headachey and a little nauseous from the altitude, and it was after 4pm, which meant we had only 2 hours of daylight remaining to descend a tricky and sometimes hard to follow trail far enough down to where we would feel okay sleeping. On the descent, my altitude sickness worsened and Seth gallantly took serious charge of the situation, letting me follow blindly behind him while he sought out a quick route down and a decent campsite. By the time we spotted a place to camp, he actually took my pack the last few hundred feet down and carried all our gear the rest of the way, where upon arrival I lay pitifully with my face in the dirt trying not to puke while he set up camp. I´ll spare you the gory details but let´s just say it was a rough night – our camp was at about 15,100 ft and I did get better as the night went on, but not without a few romance-killing moments along the way. It´s worth noting that this night was probably the most beautiful night I´ve ever seen in my life, though I was in no condition to appreciate it. The moon was full or nearly so, and the sky was lit up incredibly bright. The snowy peaks surrounding our campsite were reflecting the moonlight and looked like they were actually lit by spotlight. And to top it off, when I stepped out of the tent around 10pm for reasons you don´t need to know about, the small grassy knoll where we were camped was full – FULL! – of wild horses hanging around in the moonlight. Back in the tent, I thought – “get up and take a picture! This is amazing! Incredible! Beyond description!” But I couldn´t… and I have no photographic proof of that beautiful night. Oh well! By morning, I wasn´t actively sick anymore but also couldn´t tolerate the idea of food – I hadn´t eaten since lunch the day before which was not exactly helping me recover, so I spent about 2 hours trying to eat a cracker and some water with a rehydration powder, again while Seth did all the work of taking down camp and packing us both up. We made our way down to the valley floor with frequent breaks and then hiked a short way down this new valley – this one called Cojup – until we took an extended nap/lunch break. After some serious rest and the successful ingestion of a Lara bar, I started to feel more like a living person and so we hiked another hour down the valley until we found a nice campsite. This one was patrolled by a couple of very territorial bulls who kept bellowing and protesting our presence enough that we finally piled up some rocks by the door of the tent to throw their way should they decide to bother us during the night. In the end, they stayed away and we got a decent night of sleep before hiking the rest of the beautiful trail out on Friday morning. We hiked straight to the front door of a really lovely mountain lodge high up in the hills outside of town, and spent 2 nights in total relaxation there, reading endlessly in the hammocks, eating their delicious food, and going for high-altitude “runs” on the neighboring ridges. And that brings us to today, Sunday, where we are now back in the town of Huaraz getting ready to overnight bus it back to Lima for our flight home Tuesday night. We´ll be back in Seattle Wednesday afternoon. That´s the final update from here! Though I´m sad this fabulous month is coming to a close, I´m looking forward to seeing many of you soon back at home. ← Peru! Machu Picchu, Part II of III.